FIRST VRBO LISTING IN SANTA FE! Weekly and monthly rates are offered at a discount. High season is the same or almost the same as other seasons. If you see your dates booked, please inquire anyway! I can refer you to many others. Charming, historic furnished adobe apartment downtown, about 7/10ths of a mile to the Santa Fe Plaza. The apartment includes WIFI, satellite tv, ample storage, linens, towels, work desk, loads of information about our area. It is walking distance to the Plaza, DeVargas Mall, the highway north and south, restaurants, museums, galleries, public transportation. This is half of a duplex, and the adjoining person has three friendly dogs part-time. The apartment has a combo living/bedroom with a queen bed and an Ethan Allen sofa bed. It has all the equipment you need in the kitchen, including a washer and dryer.. The television is a flat screen and has a dvd player. The house is off the street 100 feet, where you get your own parking space to the right, not visible from the street. The apartment is one mile from our famous dog park. Most pets are allowed. A cat must not go in the back yard. YOU ARE RESPONSIBLE FOR THE SAFETY OF YOUR PETS! Please let me know what animals you are bringing, and the names of other guests coming with you. Relax on the front or back porches and enjoy the shade in the front in the summer. 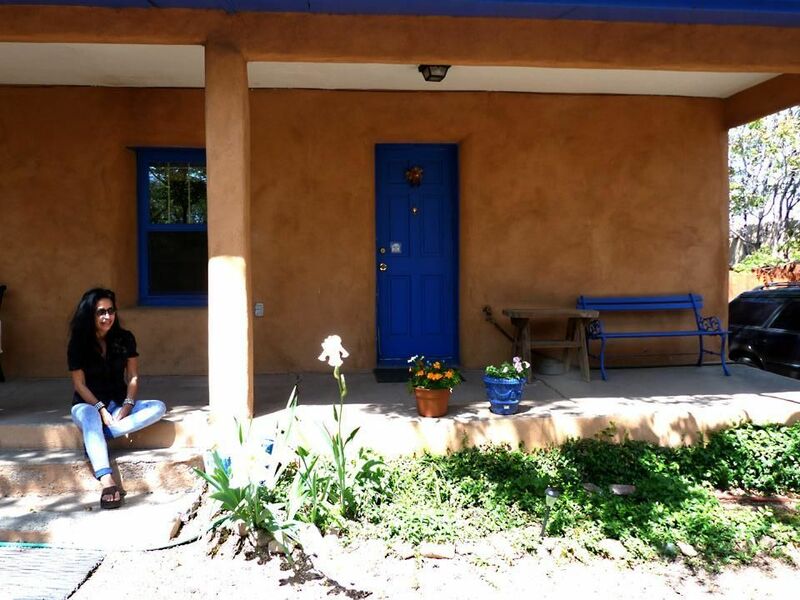 This building was constructed in 1908 and is a remodeled historic double adobe. It was a wedding present to Minnie Barela. It has hardwood and tile floors and a tile bath. The heat is gas baseboard. There is art from local artists on the walls and other Santa Fe touches. There are linens for the bed and the sofa bed. There is a window unit AC, seldom used, fans, and extra space heaters. I aim to please so your comfort comes first. Keywords: Studio-size fully furnished apartment off West San Francisco Street. OTHER SHORT-AND LONG-TERM PROPERTIES AVAILABLE! Half of a duplex. Double bed and sofa bed. Separate kitchen. Time period flexible. DSL internet. Satellite TV. Washer/dryer. Off-street parking. Convenient short walk to many attractions. I am a long-time real estate broker in Santa Fe (30+ years). I have a 501 (c) (3) animal rescue organization that I manage and pay for by myself. I personally tend to this unit and try to make sure of a wonderful stay and customer satisfaction. I have mostly great reviews on this and other sites. This house is special because of the location off West San Francisco Street and the fact that it is an historic double adobe built in 1908.. Its convenience and privacy can't be beat. It is like a sanctuary. It is not visible from the main street, and neighbors face in other directions. The beauty and history of the building is impressive. It is completely remodeled, and I update it regularly. Many people enjoy this because they don't need a vehicle to go most places and it has the ambience of a traditional neighborhood. Some have not had vehicles. There is one tenant on the other side with whom you share the front and back porches and back yard. You can walk to the mall and its two grocery stores, and walk all over downtown. I have not had any crime experience in this neighborhood in over 25 years, but caution is always advisable. Gas baseboard heat and space heater provided. The kitchen has a table for two. (2) Front and back patios. The front is shaded and the back is sunny. Note approximate distances above in meters and miles! The property is six and one-half blocks to the downtown Plaza and even closer to the DeVargas Mall, Sanbusco shopping area and many downtown restaurants, shops and theaters. It is about two blocks to St. Francis, which leads to 285 north and 599 to Albuquerque. The property and your vehicle parked there are not visible from the street.